This article first appeared in Personal Wealth, The Edge Malaysia Weekly, on September 3, 2018 - September 09, 2018. While Malaysian investors generally have enough exposure to local mid-to-small-cap companies, many do not understand what they are buying into and the risks involved, says Lim Tze Cheng, CEO of Inter-Pacific Asset Management Sdn Bhd (InterPac). “Investors do not conduct enough research on these companies or have comprehensive knowledge about them. There have been many cases where retail investors were burned after investing blindly in mid-to-small-cap stocks,” he adds. To mitigate the risks, investors could adopt a more passive investment strategy to tap the growth potential of these companies. They could do this by investing in unit trust funds or exchange-traded funds (ETFs) that track the movements of mid-to-small-cap indices. Lim took the opportunity to fill this market gap when the fund house launched the InterPac Top 30 Ex 100 Fund (iT30X) on Aug 22. “This smart beta equity fund is the first of its kind in the market. It adopts both active and passive investing strategies,” he says. The fund invests a minimum of 75% of its net asset value (NAV) in 30 listed companies and the rest in liquid assets such as money markets securities and fixed deposits with financial institutions. It benchmarks itself against the one-year average return of funds in Lipper’s Equity Malaysia Small and Mid Caps category. Lim says the fund selects companies on Bursa Malaysia that are ranked from 101 to 130 in terms of market capitalisation. As at Aug 23, the component stocks included Sunway Construction Group Bhd, Shangri-La Hotels Malaysia Bhd and IGB Bhd. 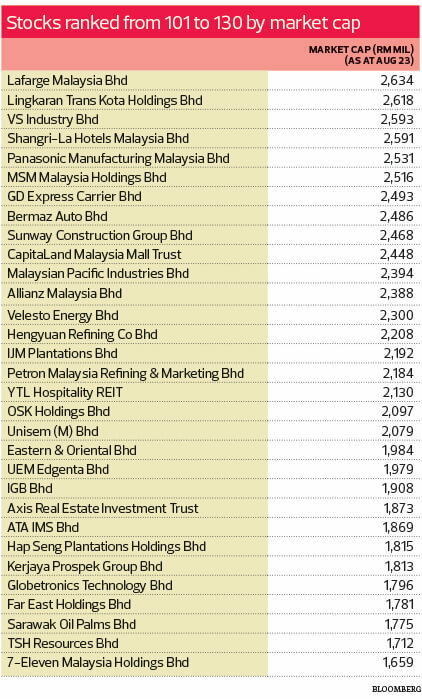 The market capitalisation of these companies currently range from RM1.7 billion to RM2.6 billion. The component stocks change depending on their share price and market capitalisation. The fund allocates 3% of its portfolio to each company on the list. The fund manager reviews the portfolio every month and rebalances it when necessary. For instance, when the price of a component stock rises and the weightage increases from 3% to 5%, the fund manager sells some shares to bring the weightage down to 3% and buys into other component stocks. “However, we would allow the weightage [of each stock] to fluctuate between 2.5% and 3.5%, depending on the situation, because a trading fee is incurred each time we buy and sell shares to rebalance the fund. The fund’s performance could be dragged down if the trading cost is too high,” says Lim. Why does the fund invest in companies ranked from 101 to 130 in terms of market capitalisation, instead of tracking the component stocks of the FTSE Bursa Malaysia Small Cap Index? Lim says it would be a very challenging task for the firm to trade the more than 160 component stocks on the index to mirror their movements. Moreover, some of the small caps are very illiquid. As a result, Lim and his team looked for an alternative way to track the performance of mid-to-small-cap companies. They back-tested a few combinations of stocks and finally came up with the iT30X fund. Lim says the back-tested results show that the fund outperformed the FBM KLCI and FTSE Bursa Malaysia Small Cap Index from 2007 to 2017. It also beat the average return of the funds in Lipper’s Equity Malaysia Small and Mid Caps category during the same period. “The fund’s volatility level is lower than that of the Small Cap Index,” he adds. The fund does not impose a sales charge if investors buy into it directly with InterPac. The annual management fee is 1.75% while the minimum investment amount is RM100. The fund manager may hold warrants issued by the underlying companies to its shareholders. However, the warrants are disposed of within three months of their issuance. Some fund houses have been reluctant to launch products with passive investing strategies. But people should be offered new and innovative ways to invest, says Lim. These include low-cost products such as ETFs and index funds. Lim says fund managers should accept the fact that many actively managed funds, especially those in developed countries, have underperformed their benchmarks over the long term after deducting fees imposed on investors. For instance, when the S&P Dow Jones Indices released its SPIVA report card in April last year, it showed that 92.15% of the large-cap funds in the US underperformed their benchmarks over the 15 years ended December 2016. By comparison, 95.4% of the mid-cap funds and 92.15% of the small-cap funds trailed behind their benchmarks. In Malaysia, a look at the Lipper Fund Table shows that the AMB Index-Linked Trust — an index fund that tracks the FBM KLCI — is ranked No 20 among 71 other large-cap Malaysian equity funds based on their one-year returns as at Aug 17. The fund is ranked No 46 over a three-year period and No 50 over a five-year period (among 64 other funds). While the performance of active and passive funds may look different locally, fund managers will find it more challenging to outperform their benchmarks when the market becomes more efficient, says Lim. “No matter how good you think you are [as a fund manager], you would still have to ask this million-dollar question: Can you continue to outperform the benchmark over the long term? Are we going to deny investors the option to invest in passive funds simply because we believe we can outperform the market?” he adds. Inter-Pacific Asset Management Sdn Bhd (InterPac) has launched the InterPac Flexible Asset Trust (iFAT) — a sustainable and responsible investment (SRI) balanced fund that invests in equities and bonds. The fund uses a negative screening methodology to exclude companies that undertake business activities that involve gaming, alcohol, tobacco and other related businesses. Fund managers invest between 40% and 60% of investor money in equities and the rest in bonds, money market instruments and fixed deposits. CEO Lim Tze Cheng says the fund is a collaboration between InterPac and Areca Capital Sdn Bhd. The equity portion will be managed by InterPac while the bond investments will be managed by Areca. “We tell Areca how much cash we have each day after investing in equities and it decides how much money it wants to deploy in the bond market,” he adds. Collaboration between smaller fund houses is a trend that Lim is trying to drive as it could help them cut costs. This would enable them to come out with more product offerings. “We have the equity capability while Areca has the bond capability. By doing so, we do not need to build a bond investment team. There are already so many bond teams out there. Why not just partner up?” he says. The fund imposes a sales charge of up to 5% and an annual management fee of 1.5%. However, investors are exempted from the sales charge if they buy into the fund directly with InterPac. The minimum investment amount is RM100.